HomeDoc En Finance in English Video documentaries The End of Poverty ? Today, the problem persists because of unfair debt, trade and tax policies — in other words, wealthy countries taking advantage of poor, developing countries. 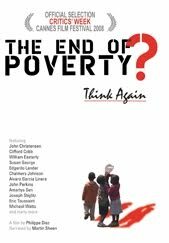 Renowned actor and activist, Martin Sheen, narrates THE END OF POVERTY?, a feature-length documentary directed by award-winning director, Philippe Diaz, which explains how today's financial crisis is a direct consequence of these unchallenged policies that have lasted centuries. Consider that 20% of the planet's population uses 80% of its resources and consumes 30% more than the planet can regenerate. At this rate, to maintain our lifestyle means more and more people will sink below the poverty line. Filmed in the slums of Africa and the barrios of Latin America, THE END OF POVERTY? features expert insights from: Nobel prize winners in Economics, Amartya Sen and Joseph Stiglitz; acclaimed authors Susan George, Eric Toussaint, John Perkins, Chalmers Johnson; university professors William Easterly and Michael Watts; government ministers such as Bolivia's Vice President Alvaro Garcia Linera and the leaders of social movements in Brazil, Venezuela, Kenya and Tanzania. It is produced by Cinema Libre Studio in collaboration with the Robert Schalkenbach Foundation. Can we really end poverty within our current economic system? Think again.